Man-made oyster reefs could be used to protect a Mearns community against the effects of tidal and rainfall erosion. A £540,000 universities grant was given to Glasgow Caledonian University for the study of landslides at Catterline in May, and now residents have been given an update on the scheme. Professor Rohinton Emmanuel and Alejandro Ollauri outlined the four-year project to a packed meeting of residents at the Creel Inn. The pair want to examine if creating mussel and oyster reefs will absorb energy from the waves, meaning they will not batter the shoreline as hard. Pieter voor de Poorte, from Catterline Braes Action Group, welcomed the idea. He said: “We have great relationships with Glasgow Caledonian University and the University of Aberdeen. “Their scientific input has led to an increased understanding of the mechanisms which undermine the integrity of our local braes, and they have helped us develop solutions to try and prevent future slips. “The funding awarded to GCU will allow us to focus on the coastal erosion issue which is affecting parts of Catterline bay. Councillor George Carr said coastal and rainfall erosion costs Aberdeenshire Council “a fortune” every year. 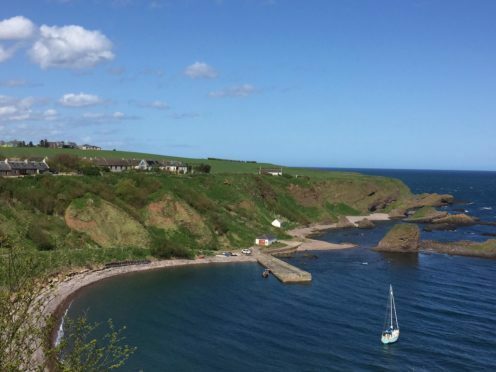 He said: “Catterline has suffered landslips over several years, which denied access to the shore and pier and threatened houses and walkways along the clifftops. “Residents decided to organise themselves into the Catterline Braes Action Group (CBAG) and instigated measures to mitigate the weather effects which were at the root of these landslips. “I have nothing but praise for the group in their efforts so far and their drainage schemes, sensitive planting and slope stabilisation with soil nailing is of major significance and important to Aberdeenshire, where we have similar problems in other coastal villages. “These natural events are costing the council a fortune year on year, so anything which can reduce these catastrophic landslips needs to be replicated. Oysters are a bivalve shellfish that are often referred to as “ecosystem engineers” because of their tendency to attach to hard substrate or other oyster shells to create large reefs made up of thousands of individual oysters. These reefs play an essential role in the nearshore coastal and estuarine environment, providing habitat for many other species including recreational and commercial fish, creating nursery habitat for fish and crabs and providing small animals shelter from larger predators. In addition to offering shelter and food to numerous coastal species, oyster reefs provide a number of benefits that promote healthy coastal environments. Oyster reefs buffer coasts from waves, reducing erosion and creating calmer waters that support the growth of coastal marshes and seagrass beds. Oysters are also extremely effective filter feeders, improving their surrounding water quality and clarity and further enhancing the health of the larger bays they reside in. Oyster reefs can be found in lower energy environments along the Atlantic coast, Gulf of Mexico, and Pacific coast.